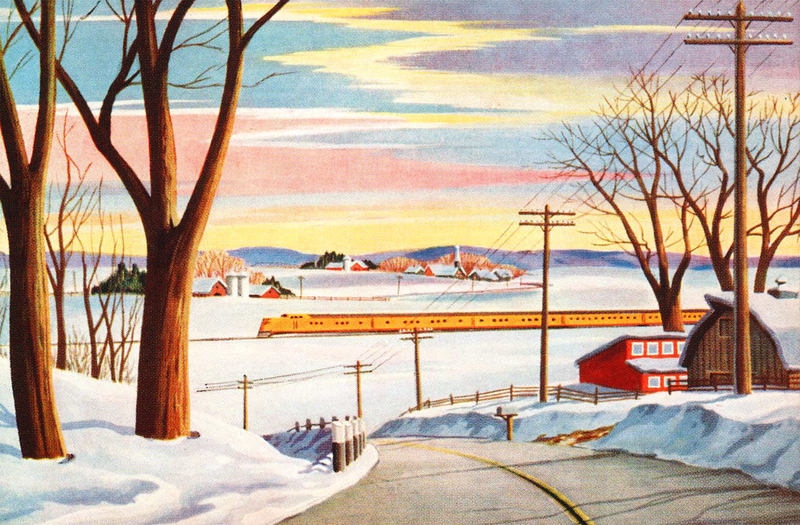 The City of Saint Louis was just one train in the Union Pacific’s premier fleet of passenger trains. A very late entrant into the railroad's City fleet, the St. Louis was not inaugurated into after World War II. However, it proved to be a fairly successful train, in no small part to the UP's reputation for impeccable service and eventually operated a routing similar to the City of Los Angeles, although at first it did not reach the Pacific Coast. The railroad hosted an entire array of plush City trains, all of which were quite successful. For the St. Louis, it was a short-lived train surviving barely twenty years under its own name. Today, the City fleet can still be witnessed, in a manner of speaking, as the UP’s official business train is not only decorated in the Cities’ classic livery but also includes some of the original equipment, right down to a set of E9As and E9Bs that power the consist. 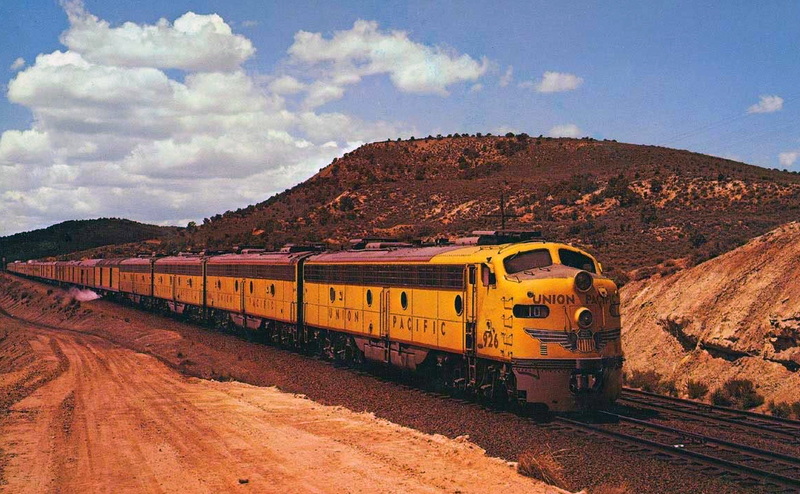 The Union Pacific, the largest and one of the most powerful railroads in the country, has been in service since 1862. The railroad is far older than any other American Class I today with the Kansas City Southern the nearest, 35 years younger. In that time UP has become not only one of the most highly respected institutions in the nation but also has seen nearly every major railroading event in our country’s history. As a result, the company has a very long and storied history. The Union Pacific’s City fleet is credited with being the first lightweight streamlined passenger train to operate in the United States. In February of 1934 the City of Salina, the first in the fleet, debuted as a three-car lightweight trainset that the was named the M-10000. The Union Pacific was so impressed with the train (although it did have some mechanical issues), and the response it received from the public that the railroad purchased seven more sets and the City fleet was born! Following the City of Salina, also in 1934, was the City of Portland, City of Los Angeles, City of San Francisco, and finally City of Denver in 1936. The later trains, notably the Los Angeles and San Francisco, operated as non-articulated consists using Electro-Motive's new E2 diesel locomotives. The City fleet became revered throughout the west and rivaled the Santa Fe’s legendary Super Chief, and every other western passenger train, in exquisiteness and fine traveling. Once the trains received their Domeliners in the mid-1950s they became the lavish way to travel for many of Hollywood's elite. The City of St. Louis was another of Union Pacific’s vast City fleet of trains connecting the Midwest with the west coast. 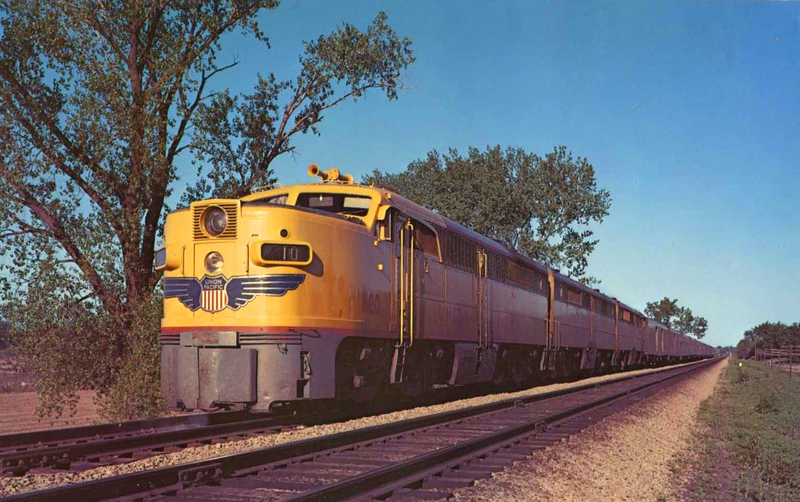 The train debuted on June 2, 1946 originally connecting its namesake city (in conjunction with the Wabash Railroad between Kansas City and St. Louis) with Cheyenne, Wyoming via Denver. For its first four years of service the train only operated through sleeper service to Portland, San Francisco, and Los Angeles via Cheyenne. 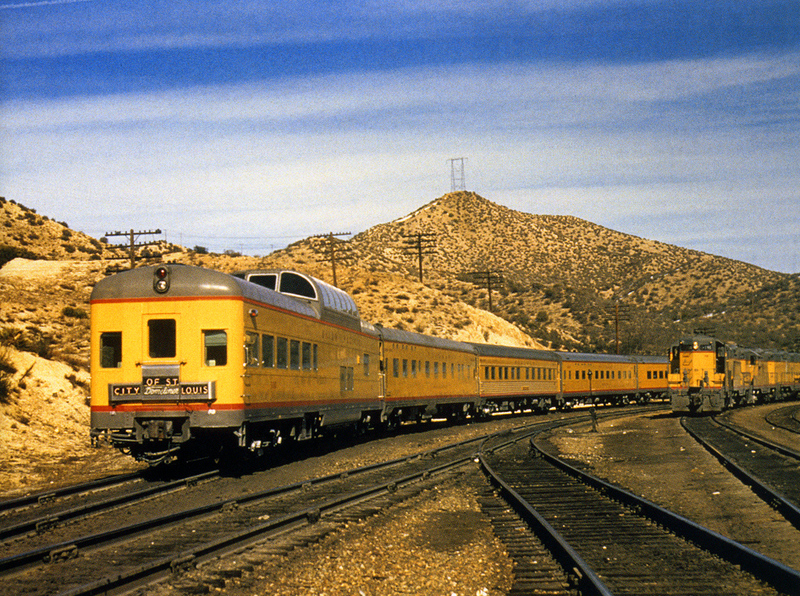 However, later in 1951 it began dedicated service as its own train all of the way to Los Angeles. Not long after the St. Louis hit the rails it was upgraded with lightweight, all-streamlined equipment in 1947 featuring diners, Pullman sleepers, lounges, observations, and even dome cars which were added in 1958 from Pullman-Standard and American Car & Foundry. After the Wabash was leased by the Norfolk & Western Railway in 1964 the latter company ferried the City of St. Louis between St. Louis Union Station and Kansas City Union Station. Operating on a schedule of nearly 47 hours the train listed as #9 (westbound) and #10 (eastbound) on UP's official timetable, normally carried an average train speed of about 50 mph the entire trip. Through the end the City of St. Louis, along with her sister City trains, remained a top-notch, all matching consist (of Armour yellow and grey) by Union Pacific. As rail travel patronage continued to slump through the 1960s the train was eventually downgraded, however, and combined with the City of Los Angeles west of Ogden, Utah. In June 1968 the City of St.Louis was further cut back, operating to only Kansas City and renamed as the City of Kansas City. In 1970 Union Pacific pulled the popular Domeliners from all of its City trains. While service remained satisfactory, however, this did not secure the Kansas City or other trains’ futures as none were retained when Amtrak began service in the spring of 1971. Today, the fleet can still be witnessed through Union Pacific's official business train.